Stomatitis -- chameleon mouth disease -- affects the oral cavity, tongue, palate or oesophagus. Stomatitis may be caused by several things, including bacterial infection and poor nutrition. Chameleons are extremely fragile animals and suffer from a variety of infections and deficiencies if not well maintained. If untreated, the infection can attack the jaw bone. Chameleon mouth disease may be caused by poor animal husbandry and nutrition. Other causes may include poor temperature regulation, vitamin C deficiency, overcrowding and improper phosphorous and calcium levels. It can also be caused by a trauma in the mouth due to a wound or scratch. At the early stages of stomatitis, you may witness a stained gum line with brownish yellow matter surrounding the periphery of the gums and teeth. You may also observe a slight swelling of the lower jaw and occasionally a dehydrated film-like matter on the periphery of the mouth. If the infection is not treated on time, you will notice complete loss of appetite. 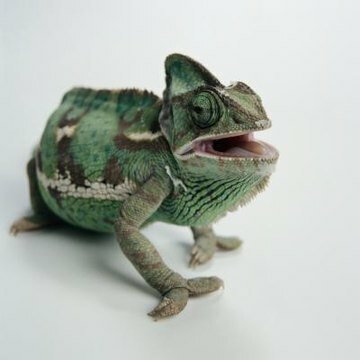 If you observe any of the symptoms of stomatitis, have your pet checked by a reptile veterinarian immediately, since the infection may spread to the teeth or invade deep into the jaw. The veterinarian will observe the animal for the symptoms and take a sample test of blood and mucus. This is to check and determine the bacteria present and accountable. The prime treatment involves antibiotics injections. If the condition is severe, the animal should be anesthetized and have the infected bone or teeth surgically removed. The vet may also prescribe an anti-bacterial solution to apply on the affected area for some period. During the treatment period, the temperature must remain constant, warm and hydrated. You may feed your chameleon by hand during this period. Since chameleons are extremely delicate, observe them for any disparities in their behavior, including their positioning in the cage, appetite, color change, as well as activity level. Also, check on the recommended temperature preferences of the species. Keep chameleons in cages that are adequately ventilated and have a relative humidity of about 50 to 75 percent. Ensure that they are well fed with a variety of insects, and occasionally dust the insects with calcium and vitamin powders. Margaret Root has been a professional writer since 2000. She worked as a senior editor at VetMedCenter from 2000-2008. Root holds a Bachelor of Science in veterinary science from University of Minnesota, College of Veterinary Medicine. Her work appears in numerous online publications including Today’s Veterinary Practice.